I don’t know about you, but the Vandals’ blow-out victory over Colorado State in the Famous Idaho Potato Bowl before the holidays is still making me smile – and that’s saying a lot when you consider that it’s January, the temperature is dipping into single digits, and the only things growing in Moscow are the icicles on the Administration Building! 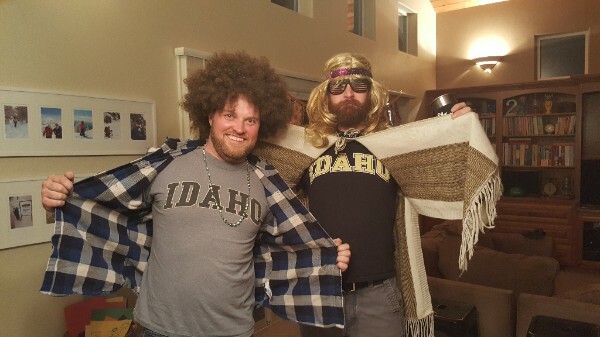 It truly was a grand day for the University of Idaho. Vandals showed up in force, braved the cold and cheered the team to a delicious and well-deserved victory. Vandal Pride was palpable inside the stadium and out, and culminated in an after-party with nearly 600 Vandals on hand to congratulate Coach Paul Petrino and the team. Amazing! The good thing about being a Vandal, though, is that there is always something to celebrate. The accomplishments of stellar alumni for example. Your successes professionally, in the community and on behalf of the university make a positive mark on the world that we can all be proud of. 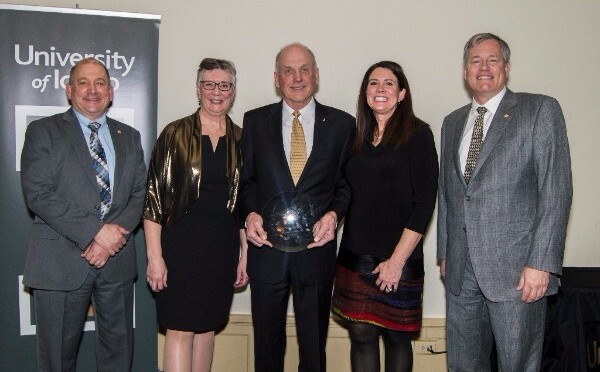 The UI Alumni Association – dedicated Vandals serving the entire alumni base with programming that benefits us all – sponsors a robust awards program that honors alumni for a variety of reasons. We also will honor Howard Foley ’69, ’71 with the Jim Lyle Award, which is named for the university’s long-time alumni director and recognizes long-term dedication and service to the university and to the Alumni Association through volunteerism. 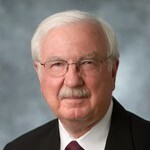 Howard, who earned his undergraduate degree in business as well as his law degree from UI, epitomizes the spirit of the award, working as a volunteer on behalf of the university, the Vandal Scholarship Fund, the UI Alumni Association, the College of Mines and Earth Resources Advisory Board and much more. More details about the event are available here. I hope you are able to join us to help celebrate Doug and Howard. Later this year, we will be honoring a number of other stellar Vandals – details to come on those events. 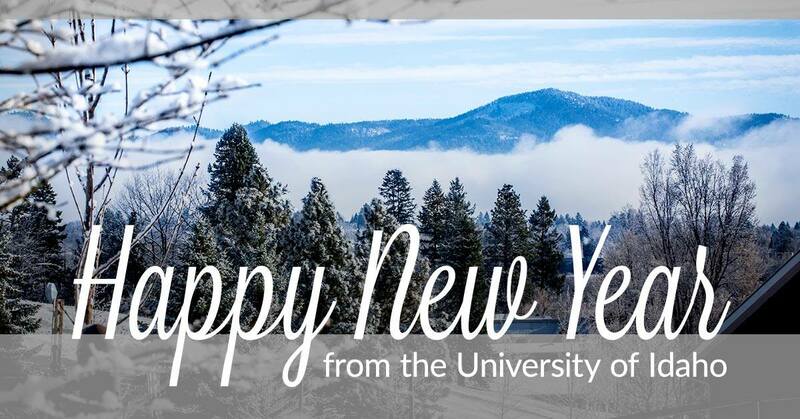 Here’s to making every day of 2017 an opportunity to celebrate and support the University of Idaho! Hall of Fame recipients will be announced in the spring prior to commencement. 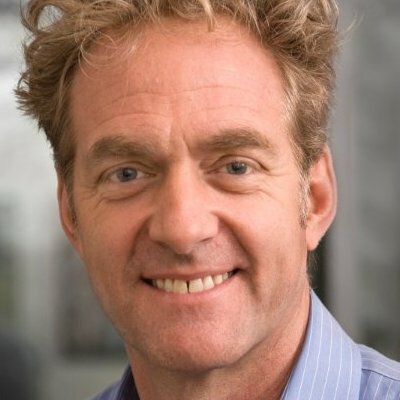 Craig Redmond leads Mercy Corps' program operation and development, as well as financial services, innovations and emergency responses around the world. He leads a team of almost five thousand people delivering nearly a half billion dollars of programming which serves millions of people annually. He has worked in international development and humanitarian response for over 20 years. He was awarded the Ells Culver Innovation and Leadership Award in 2016 for his work at Mercy Corps. In June of 2016, Don Shelton was named the Executive Editor of The Seattle Times, a role he currently holds, leading the largest news organization in the Pacific Northwest. Shelton has worked as a journalist for 40 years, 29 of those at the Seattle Times. He took the role of Seattle Times Sports Editor in 2009, transforming the department and seeing the sports section honored with "Grand Slam" recognition from the Associated Press Sports Editors Association. 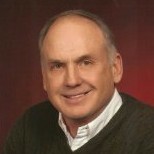 Doug Gross is the CEO of Gross Farms Inc. 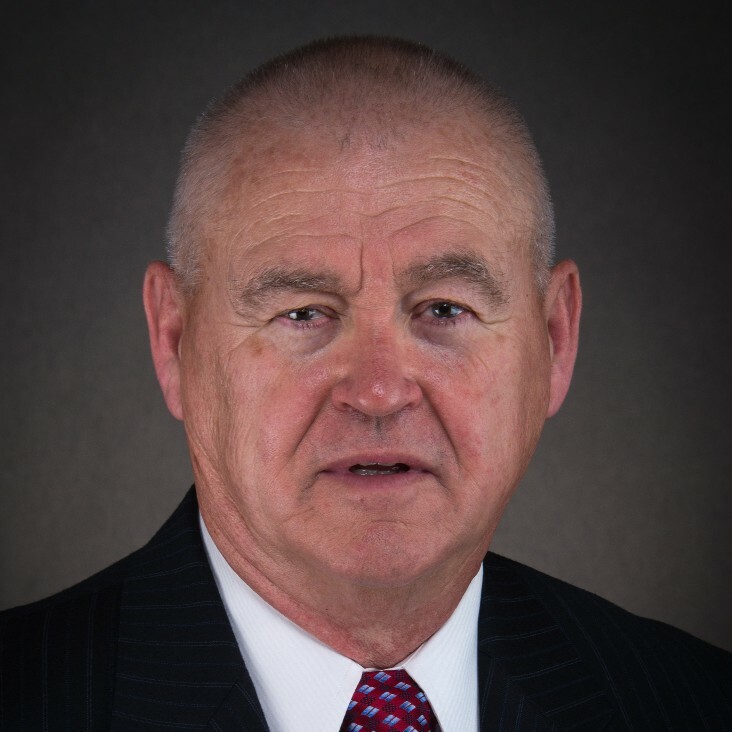 He is recognized by the industry and his peers as an exceptional potato grower and has served in various industry groups, including the Idaho Potato Commission. He recently established an endowment for the potato program in Idaho, funds from which will be used for graduate students to tour the state visiting various aspects of the potato industry. Gross also established the Judith Gross Memorial Fun after the passing of his wife. The fund supports students in the Vandal Marching Band. 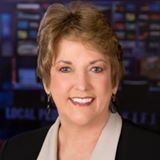 Karole Honas has worked in television for nearly 39 years, serving as an anchor at KIFI Local News 8 for the last 26. She was recently inducted into the Silver Circle of the National Academy of Television, Arts, and Sciences, an award honoring dedicated broadcasters who have made significant contributions to the industry and communities in their region. People look to her as a respected, leading voice to investigate and report on the important issues facing communities in Eastern Idaho and Western Wyoming. Lynn Davis began his career in the U.S. Army as a second lieutenant assigned to the Field Artillery Corps. He served two tours of duty at the Army's Cold Regions Test Center in Fort Greely, Alaska. 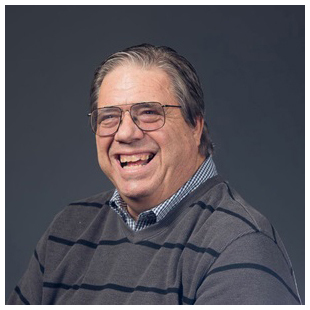 In 1977 he joined Teledyne Wah Change in Albany, OR, a company that manufactures metals for nuclear, aerospace, medical and corrosion applications. In 2000, Davis was named president. In 2008 he was named group president of ATI Primary Metals and Exotic Alloys over seven manufacturing plants across the U.S. He is currently retired. 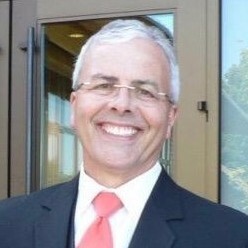 Howard Foley is currently an attorney and shareholder at Foley Freeman, PLLC in Meridian, ID. 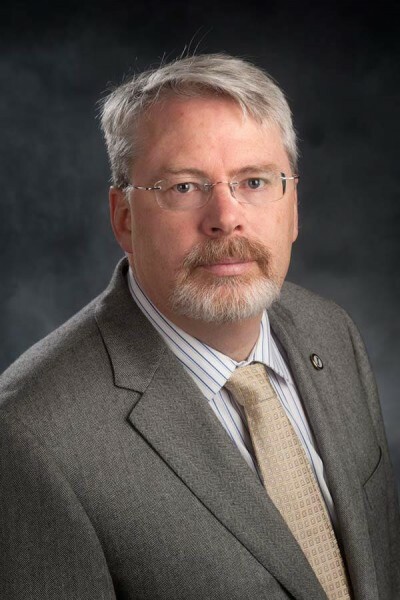 He has been an active member of the Vandal Scholarship Fund (VSF), serving for 15 years as a board member and one year as president at the national level. Foley continues to fundraise for VSF and has been recognized as the Vandal Booster of the Year twice. He is active in the Alumni Association, attending numerous events and alumni chapter activities for over 40 years. Foley has also been active in other scholarship fundraising roles for the university and the state of Idaho. Watch for future announcements regarding events honoring UIAA award winners. As we venture into 2017, it is a great pleasure to reflect on the many accomplishments of the University of Idaho community in 2016. 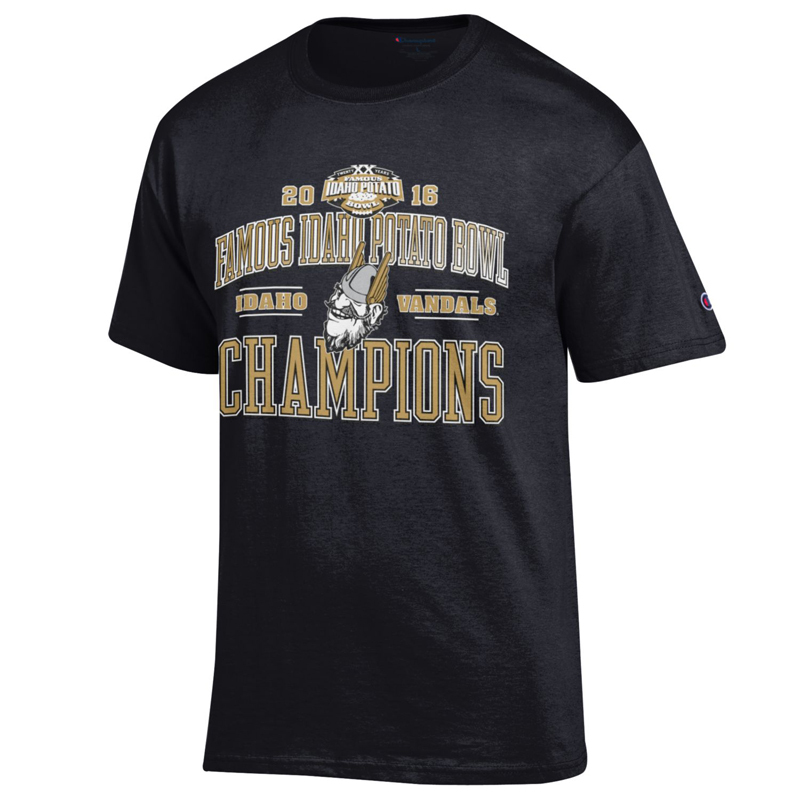 Make sure to get your Vandal bowl championship gear! Join us in honoring Howard Foley and Doug Gross for their service and dedication to the university. 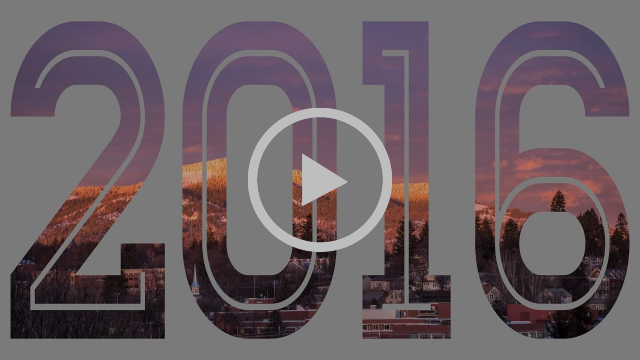 Join the week-long celebration of everything that makes the University of Idaho great. Enjoy the talents, achievements and involvement of your students during Moms' Weekend. University of Idaho Athletics looks forward to the opportunity to congratulate the student-athletes that will be signing their Letter of Intent the first week of February. We are proud of our recruits and look forward to the opportunity to welcome them to the Vandal family. Alumni Paul Singer '09, '12 and Trevor Fulton '08, '14 reveal their Vandal gear while ringing in the new year. Regardless of major or graduation year, nearly every Vandal I know talks about how cared for they felt while at the university. They remember vividly the professors or staff members who took an interest in them and, literally, changed their life. Strong emphasis on student success has been a hallmark of a University of Idaho education for generations, and thanks to Provost John Wiencek, will continue to be. 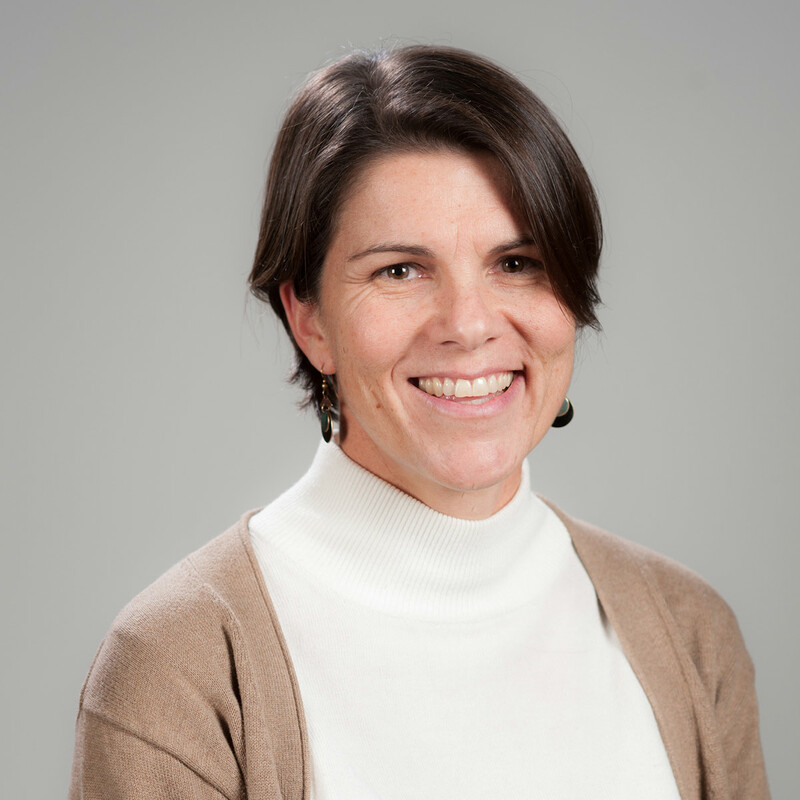 Just last week, Provost Wiencek announced a new Student Success Initiative to be led by the new Vice Provost of Strategic Enrollment Management Dean Kahler. The campus wide initiative is designed to bring together all of the offices that support students together in a convenient, centralized “Vandal Success Center.” In addition to the Provost’s Office, the center also has the support of Enrollment Management, Academic Initiatives and the ASUI. More details to come as the center is established, but as an alum, you can be proud that the university is marshaling resources in new ways to make it easier for every student to get the support he or she needs. Retaining students is a critical step in attaining the enrollment growth goals outlined in the university’s Strategic Plan. Recruiting is the other half of the equation. 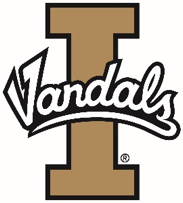 Next week, UI leaders, faculty, staff and alumni will gather for two “Meet the Vandals” events – one in Idaho Falls on Monday, Jan. 23, and a second in Boise on Wednesday, Jan. 25. 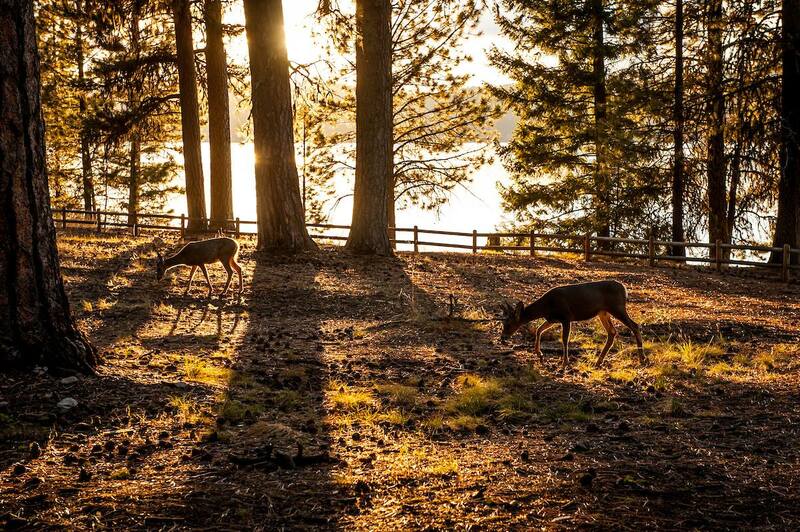 A third session is scheduled for Jan. 31 in Coeur d’Alene. More details are available at https://www.uidaho.edu/events/meet-the-vandals/about. Each of these events provides prospective students and their parents an opportunity to learn about the details of academic programs and university services, such as majors, student life, housing options, financial aid, how to apply and much more. The Boise event has the added feature of a university panel – including members of the UI Parent and Family Association – answering questions and sharing their experiences with the parents and family members of prospective students. There are many ways for any alumni to participate in recruiting the next generation of Vandals. The Vandals in Partnership (VIP) program is designed to make alumni involvement easy, and perhaps more importantly, scalable for the time and effort you have to commit. The easiest thing to do is nominate high schoolers or even junior high schoolers we should be recruiting through the Grow the Gold program. There are other, more time-intensive, ways as well that are outlined on the VIP website. Whether through recruitment or retention, growing the Vandal Family is critical to the strength of our university, our state and our world. Start thinking about how you can help and thank you in advance for your support! Grow-the-Gold: Only have a few minutes of time to donate but eager to impact the growth of the Vandal family? Nominate a future Vandal for the Grow-the-Gold program. 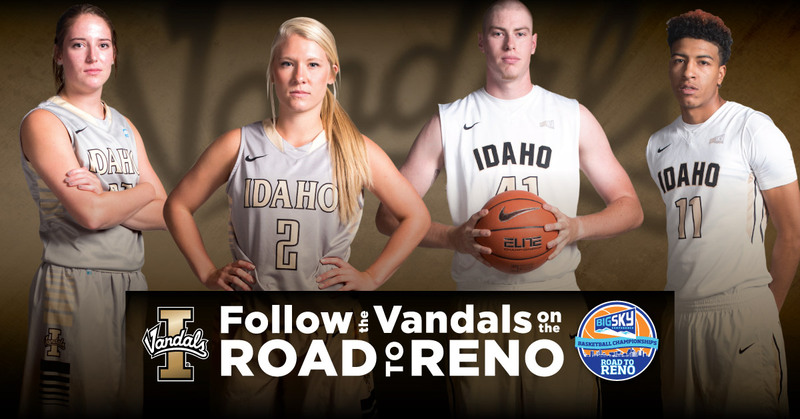 Pave the Road with Silver and Gold: Help spread Vandal pride far and wide! Vandalize your home, business or self, the opportunities are endless! Recruitment Events: Share your personal stories, successes and Vandal experiences with students and their families at a variety of events in Idaho, Oregon, Washington and California. Luncheons: Join UI Admissions and other alumni for lunch, networking and collaborative open discussions. VIP Recruitment Partner: Take part in specialized training, sit on panels at events and more as a VIP Recruitment Partner. Thank you for supporting the next generation of University of Idaho alumni! 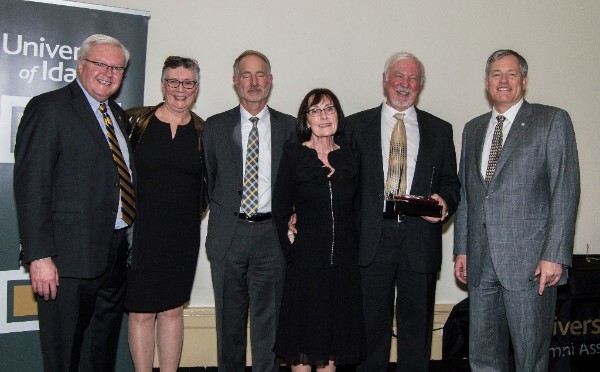 The University of Idaho recognized late mathematics professor Paul Joyce Tuesday night with the unveiling of the Paul J. Joyce, Ph.D. Faculty and Staff Lounge in Brink Hall. About 60 people attended the event, which honored Joyce’s contributions to the university during his time as the dean of the College of Science. “Paul’s vision for this room as a place for interdisciplinary collaboration and conversation came to pass in 2013 … it is fitting that the lounge be rededicated in his name,” said Director of General Education Kenton Bird. UI President Chuck Staben opened the ceremony by recognizing the lasting impact Joyce left on many of his peers. Staben said he will always remember how Joyce described the university to prospective students visiting campus. 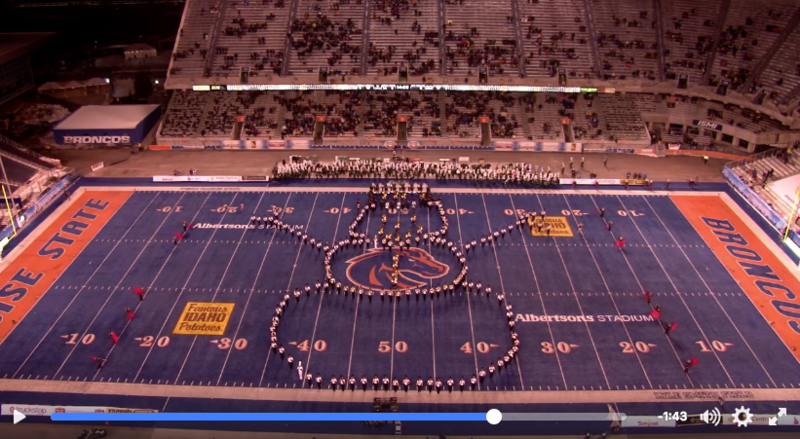 Relive the fantastic performance put on by the Vandal Marching Band during the halftime show at the Famous Idaho Potato Bowl! Watch it on their Facebook page. The University of Idaho College of Education was ranked among the Best Online Graduate Education Programs for 2017 by U.S. News and World Report. U.S. News ranked online programs on five categories: Student engagement, student services and technology, admissions selectivity, faculty credentials, and training and peer reputation. More than 1,300 online programs were assessed, and the College of Education was 185th among the Top 200 in the U.S. The College of Education’s accredited online programs offer flexibility for working professionals and in-state tuition for all courses. Programs are innovative and often interdisciplinary and Vandal alumni are employed throughout the nation. The college offers online master’s programs in curriculum and instruction, educational leadership, physical education and special education. For more information about online programs, go to http://www.uidaho.edu/ed/academics/online-degrees. Please join University of Idaho President Chuck Staben and Vice President for Research & Economic Development Janet Nelson for the Integrated Research and Innovation Center Ribbon Cutting. 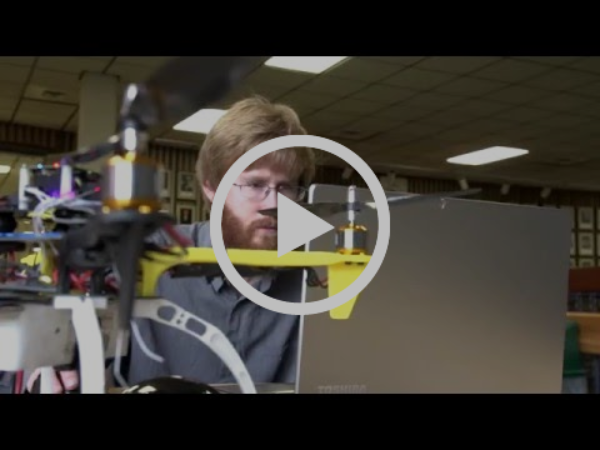 Learn more about IRIC at www.uidaho.edu/iric. 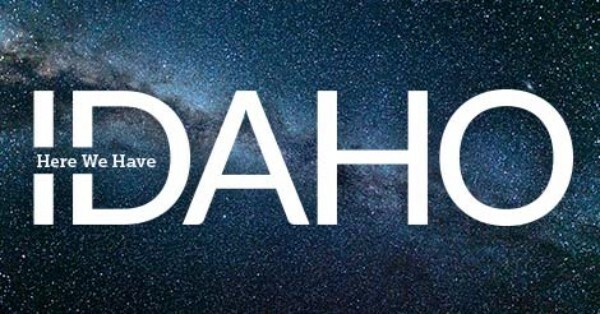 PLEASE NOTE: I Heart Idaho Week has been moved from February to April. Tickets for the 2017 Hemingway Festival Literary Evening are now available. The premier evening and fundraising event for UI’s Hemingway Festival, is scheduled for Saturday, March 4, and will celebrate the 100th anniversary of Ernest Hemingway’s graduation from high school. The evening will showcase Hemingway’s high school writings, along with prize-winning submissions from the 2nd Annual Hemingway Festival High School Writing Contest. But new technology is allowing researchers in multiple disciplines to get a real-time, bird’s eye view of Idaho's changing landscape. UI professor Janet Rachlow in the Department of Fish and Wildlife Sciences — along with researchers from Washington State University, Boise StateUniversity and Idaho State University — is using UAVs to better understand Idaho’s sagebrush habitat, and help the state’s pygmy rabbit population. The research is funded by a $341,000 grant from the National Science Foundation. Do you know these Vandals? If you recognize these Vandals, let us know at vandalvibe@uidaho.edu. One of the best parts of traveling – and last week, that meant Boise for the Legislative Luncheon, Meet the Vandals, Silver and Gold Awards banquet and the Alumni Association Board meeting and Twin Falls for the Magic Valley Vandal Scholarship Fund Winterfest– is getting an unexpected glimpse of the silver and gold. Of course, I understand there are Vandals living around the globe, but I am always pleasantly surprised when I am outside of Moscow and see someone dressed in their Vandal gear or hear a “Go Vandals!” as I walk down the street. 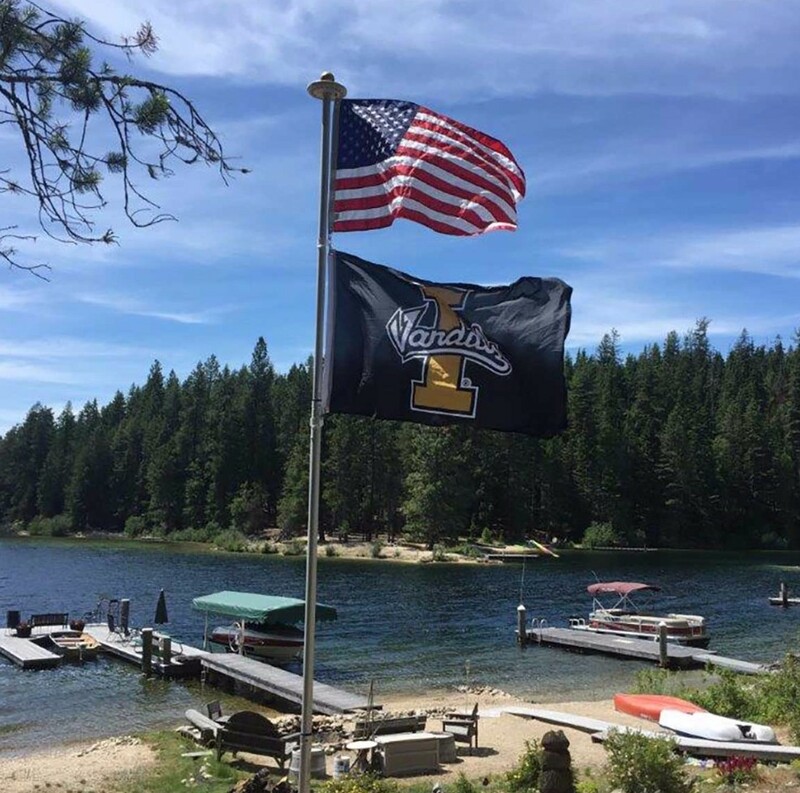 Many alumni have shared their stories of wearing their Vandal gear while visiting the East Coast or Europe or anywhere else and being approached by their fellow alumni with a smile and "Go Vandals!" This trip I noticed another great sign of Vandal spirit, at least for those of us in Idaho. Amid that sea of blue and orange in Boise were more than a few University of Idaho license plates! The commemorative Vandal I license plate can be purchased through your county Department of Motor Vehicles or you can apply online. Details are on the Office of Alumni Relations website under Vandal Pride Products. 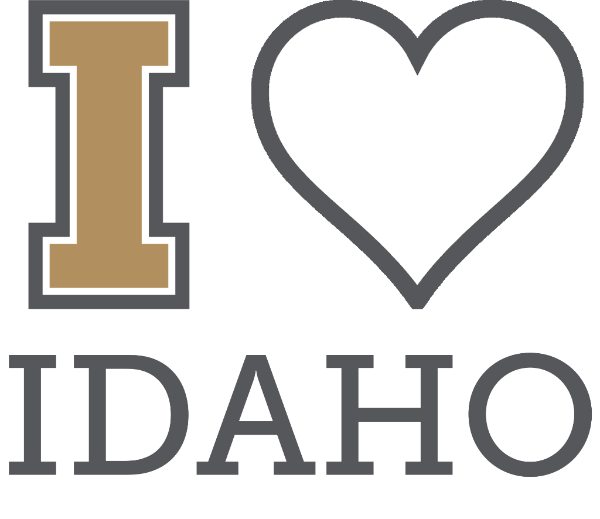 In addition to the pride factor, all proceeds from license plate sales support the University of Idaho Vandal Pride Scholarship – to the tune of $350,000 to date! About 2,500 Vandal plates are being displayed – how wonderful would it be to have 10,000? We all will have another opportunity to display the colors as part of this spring’s Pave the Road campaign. As a way to welcome prospective students and their parents to the UIdaho Bound events on March 25 and April 1. Start thinking now about how you will “Vandalize” your part of the world. Details, registration and more about Pave the Road involvement is available here. 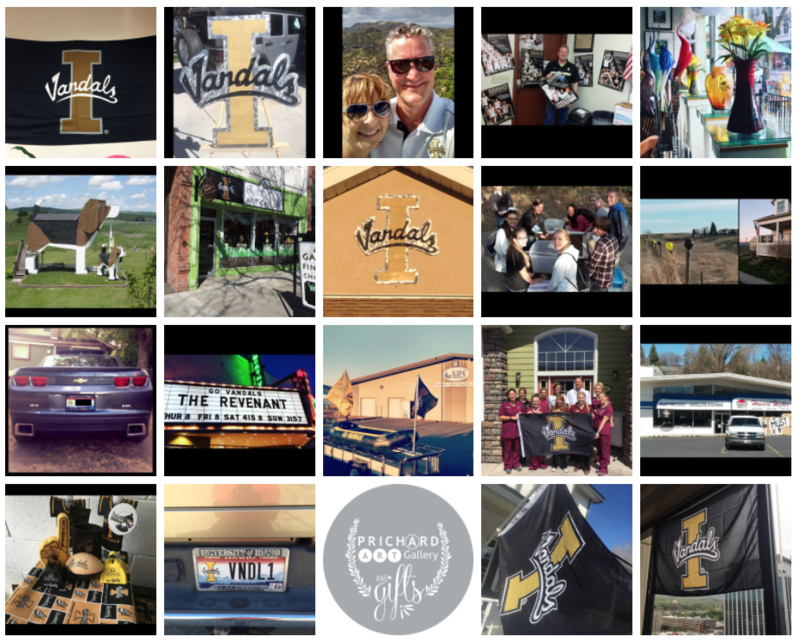 Alumni wearing the colors and showing their Vandal pride on their person, their home or their vehicle is a visual reminder of the impact our wonderful alma mater has on the individuals and on the state. So, display the silver and gold loud and proud whenever you can and know your fellow alumni appreciate it. 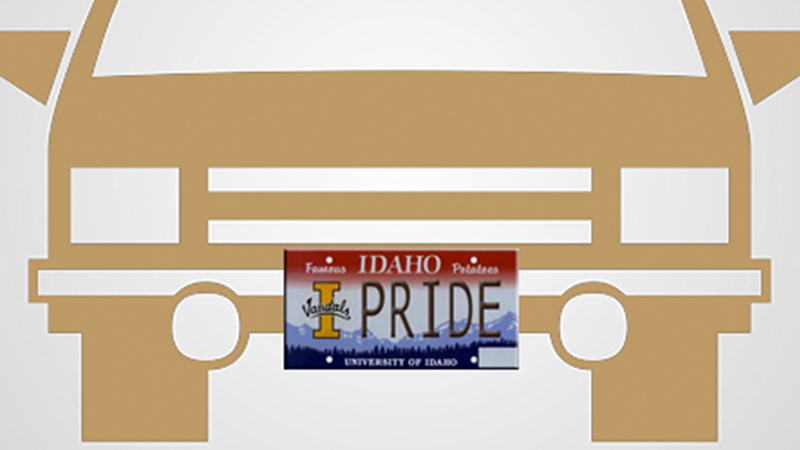 Display your Vandal Spirit with a commemorative Idaho Vandal I automobile license plate. Proceeds from this program go to the University of Idaho Vandal Pride Scholarship. Your generous support of this program has generated more than $350,000 total toward UI student scholarships and Financial Aid for more than 525 University of Idaho students since the creation of the program. Custom and souvenir plate options available. Thank you for supporting the next generation of University of Idaho alumni! 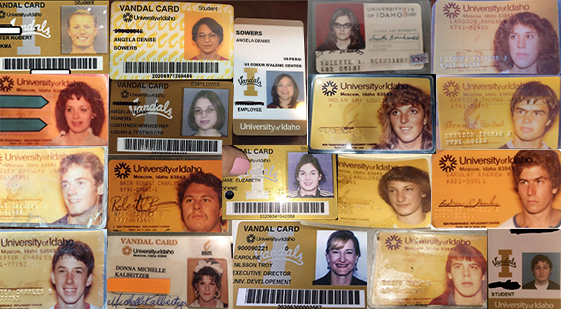 Do you still have your Vandal ID? MOSCOW, Idaho – The University of Idaho's new research building on campus is on full display Monday as organizers are getting set for its ribbon cutting ceremony on Tuesday. 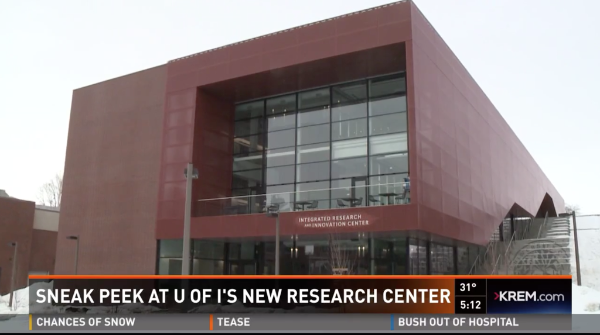 The Integrated Research & Innovation Center (IRIC) is the first new research building on campus in 15 years, university officials told KREM 2 News. If there is anyone that is pumped about the new space, it is the people at Polymorphic Games. "We were pretty much waiting outside the building for it to unlock," said Barrie Robison. Robison is part of a video game design studio that is based at the University of Idaho. The new research building is a definite upgrade from their previous digs. The $52 million facility is state of the art in its modern design, officials said. They also said it is unique because it is available for anyone on campus to use a research space. It is not limited to just one college, per se. Russ McClanahan is the IRIC Facility Manager. He said the idea for the building is simple: bring big ideas together all at one location. 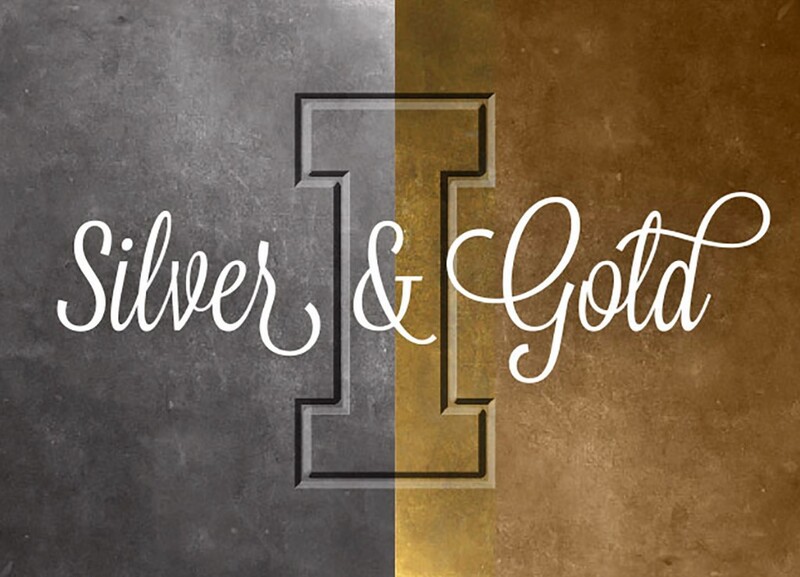 Congratulations to alumni Doug Gross and Howard Foley, honored at the Ada County Silver and Gold celebration for accomplishments and contributions to their communities and the Vandal family. The Lionel Hampton Jazz Festival will celebrate its 50th year with a unique set honoring Lionel Hampton’s and Benny Goodman’s careers on Friday, Feb. 24. The Hampton-Goodman Tribute features Stefon Harris on vibraphone, Anat Cohen on clarinet, Joe Doubleday on vibraphone and Felix Peikli on clarinet. 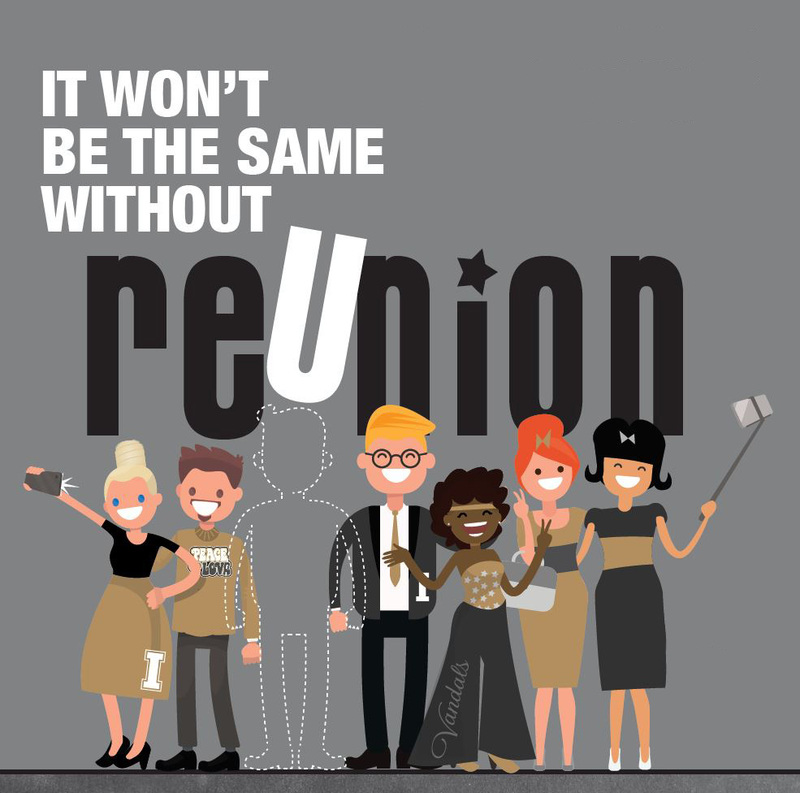 Whether you fell in love at your first freshmen dance or met your sweetheart later, the University of Idaho is thrilled to share a special connection with you and your partner. 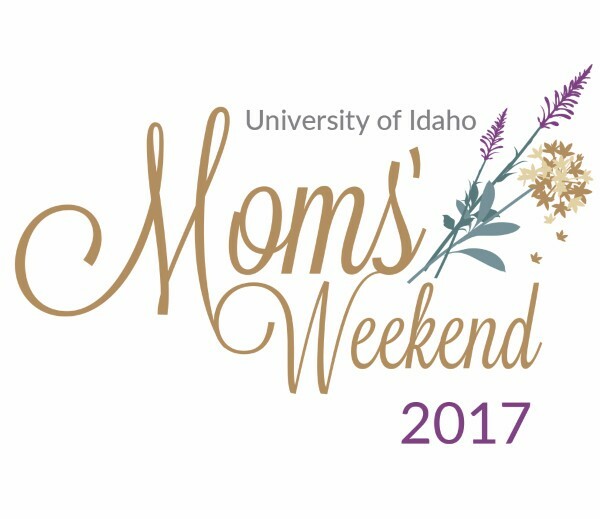 Join the weeklong celebration of everything that makes the University of Idaho great. Join your fellow Advertising Competition Team alumni in Moscow to celebrate its many successes and the career of Mark Secrist, Ad Team’s founder. Happy Birthday University of Idaho! 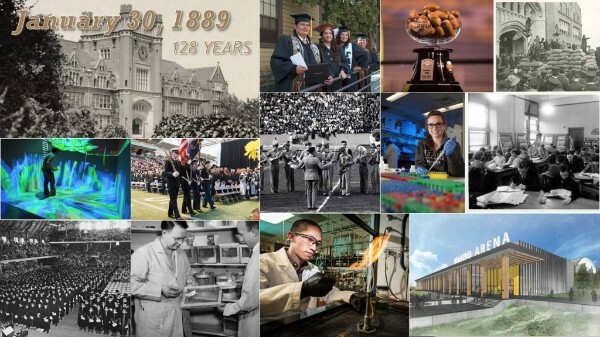 On Monday, Jan. 30 we celebrated 128 years as Idaho's great public research university. May we continue to win our way to fame, silver and gold in the sunlight blazing. It’s time to prepare show your Vandal colors! 1) Sign up and 2) post a Vandal pride photo on the Alumni Facebook page to be entered in a drawing for some Vandal swag. 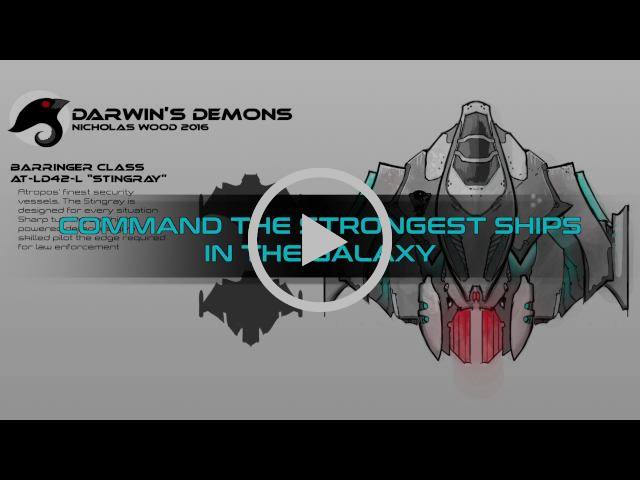 The University of Idaho is home to Polymorphic Games, a video game design studio that uses evolutionary principles to create revolutionary games. Last summer, a team of students with specialties in computer coding, art, writing, music, videography, virtual design and biology created Polymorphic Games’ first full-fledged product. Throwback to a beautiful fall sunset on UI's McCall Outdoor Science School campus. Just when I think I can’t stand one more gray February day on the Palouse, it happens – bright, sun-yellow school buses from all over the state and region appear on the Moscow campus. Crowds of excited young people – some in tuxedos or floor-length gowns – amble from one end of campus to the other. Ridenbaugh Hall, the School of Music and the Pitman Center buzz with wild guitar riffs, the blare of horns, bursts of song and laughter. The Lionel Hampton Jazz Festival – which runs from Feb. 23-25 this year and celebrates its 50th anniversary – is one of our alma mater’s finest points of pride. 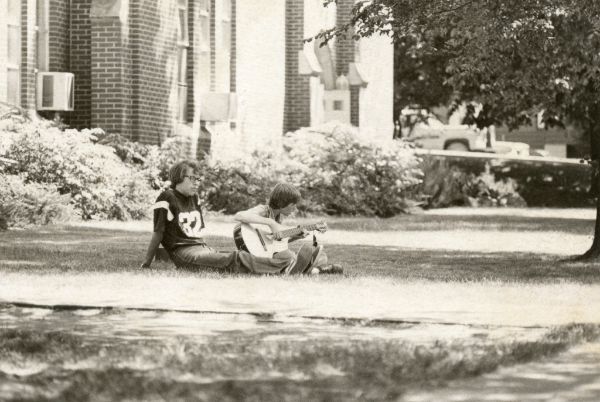 Throughout its storied history, the festival has hosted some of the greatest jazz talent in the world, and quite uniquely, partnered them with fledgling musicians – some as young as elementary school age. The result? Three days of magic that literally changes lives. I remember a workshop at the festival more years ago than I like to admit. Trumpet phenom Dizzy Gillespie was sharing his technique with a room packed with student musicians. He walked on stage with his signature upturned horn, sat on the stool provided and said, “I need a drummer.” Immediately, a dozen hands shot up from the audience. He chose one, a young man who just happened to be celebrating his 21st birthday that day. If ever there was a portrait of pure joy, it was the face of that young musician drumming with one of the all-time greats. That is the kind of magic that happens multiple times a day at the Lionel Hampton Jazz Festival. As with any half-century old program, there have been adaptations and evolution. The festival has returned to its roots in the Lionel Hampton School of Music in the College of Letters, Arts and Social Sciences, and is once again laser-focused on its long and stellar history of music education. Not surprisingly, the reaction has been positive – we are seeing more participating students and schools returning to this festival than we have seen in the past several years. Ticket sales are up, too. Ticket sales have more than doubled for both the Thursday and Saturday night concerts, but you can still get great seats. Tickets are available at uidaho.edu/ticketoffice. The full 2017 evening concert lineup is available online or via the Jazz Festival Guidebook app. The calendar says spring doesn’t start until March 20. That might be the case for the rest of the world, but for Moscow, Idaho, it starts when the first bus arrives for Jazz Fest. 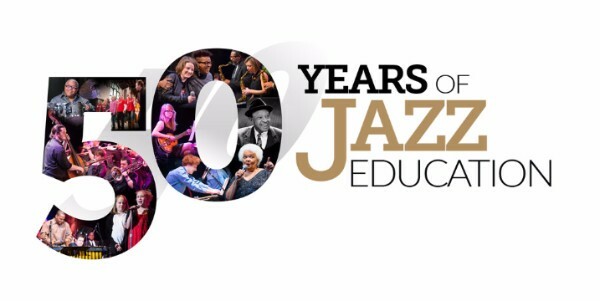 The University of Idaho Lionel Hampton Jazz Festival is one of the largest and oldest educational jazz festivals in the world. With over 400 student performances, a dozen world-class jazz artists and nearly 100 workshops, clinics and special exhibits, the Lionel Hampton Jazz Festival honors the music, dance and history of jazz music and one of its most honored artists, Lionel Hampton. The 2017 Lionel Hampton Jazz Festival begins on Feb. 23 and ends Feb. 25. We are so impressed with how many Vandals hold on to and cherish their Vandal ID. What a great memento. Thank you for sharing, Vandals! They’ve created “Abundant,” an artistic celebration of aphids and their place in the world — and in it, have captured the sense of wonder Eigenbrode, as a scientist, feels for his subjects. 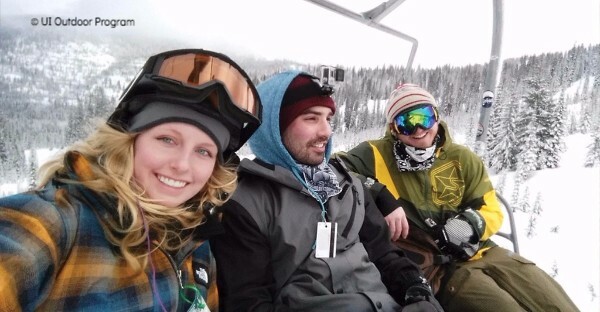 Bundle up and join University of Idaho alumni and friends in McCall for Vandal Day on the Slopes at Brundage Mountain! 9:30 a.m. - Lifts start running. If you don’t have a pass, tickets can be purchased at https://brundage.com/tickets-passes. You can save up to 30 percent if purchased in advance. 1 p.m. - Take a break from the mountain and join us for a barbecue in the Upper Parking lot – just look for the Vandal tent. 5-7 p.m. - Apres Ski in the Mill Room at the Shore Lodge. Warm up after the day's activities and join us for delicious hors d’oeuvres and no-host drinks. 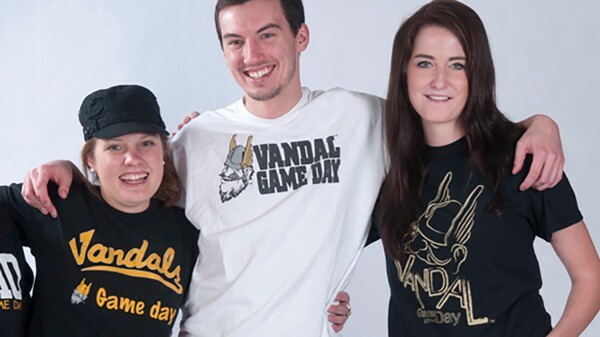 The 2017-18 Vandal Game Day T-Shirt contest has begun! "When I was a junior and Nancy was a sophomore we were active members of the Helldivers. One night while we were practicing for a show, some of Nancy's friends dared her to push me into the pool, fully dressed. She did. About a year later my revenge was to marry her. On March 6 we will celebrate 58 years together." View all the 2017 Vandal love stories on the UI Alumni Facebook page. 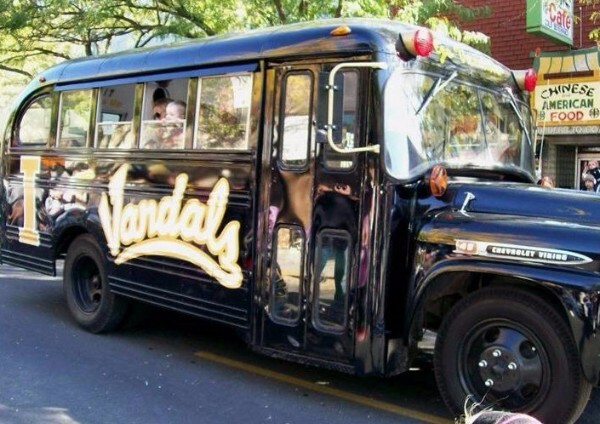 Let your Vandal pride and colors fly as we cheer on students and their familiar as they make their way to Moscow. Enjoy the talents, achievements and involvement of your student during Moms' Weekend. 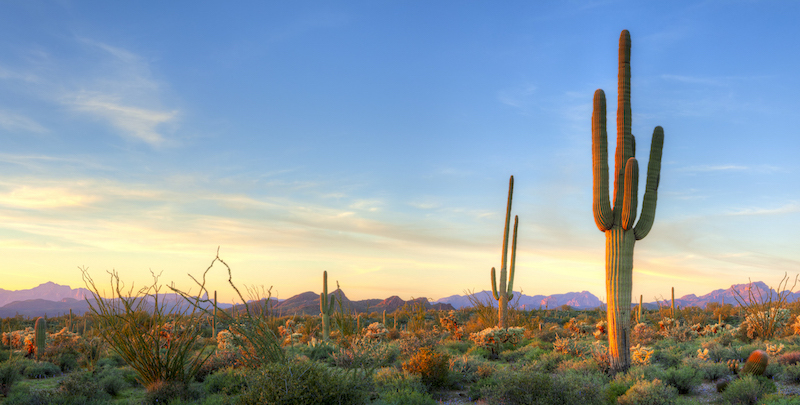 Mark your calendar and join us for some fun in the sun this spring in Arizona! Join us in the Pavilion at Peoria Sports Complex as the San Diego Padres take on the Los Angeles Dodgers. Game will be watched from the same location. Cost: $45 - includes ticket plus a delicious buffet consisting of pulled pork, grilled chicken, hamburgers, hot dogs,coleslaw and cookies. Your admission ticket(s) will be mailed to you prior to the event. No-host beverages will also be available on site. Be our guest in the Budweiser Upper Pavilion at Tempe Diablo Stadium as the Anaheim Angels take on the Colorado Rockies. Guests will watch the game from the same location. Bill Stoneman '66, former general manager of the Angels who now serves as senior adviser to the Angel's general manager, will be our special guest. Cost: $55 - includes a delicious all-you-can-eat lunch and non-alcoholic beverages. A no-host bar will be available. It is a terrific location, providing lots of shade on those extra hot days. You may also venture out to the grassy area in the outfield. Join the fun at the Arizona Grand Resort and Spa, a truly premier golf course. Cost: $99/player, to be paid in advance. Punxsutawney Phil may have said six more weeks of winter, but we know the rain is on its way. 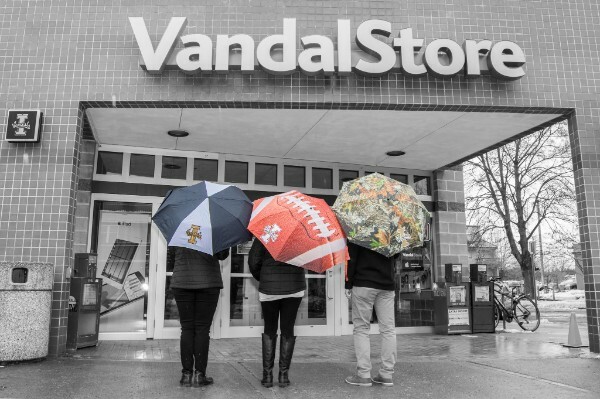 The VandalStore can help you prepare in Vandal style. The 2017 Big Sky Basketball Championships are just one month away, and the teams are gearing up for a late-season push on the #RoadToReno. 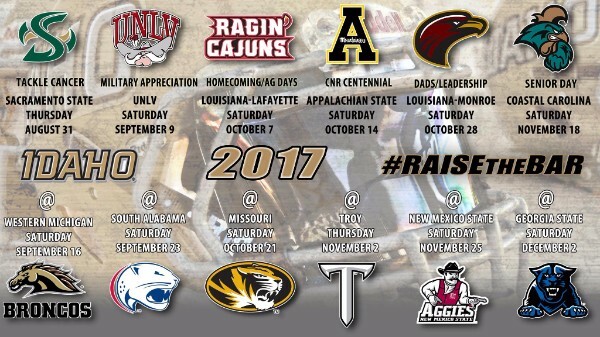 Cheer your Vandals on in Reno or visit the alumni watch party page for places to view near you. All-session tickets are available on GoVandals.com now through Feb. 20. Women's tickets are currently just $38, while the men's all-session pass is just $80. Fans are encouraged to buy their tickets early, as prices will go up and all sales will be through the Big Sky Conference after the Feb. 20 deadline. Pregame celebrations will be held before the men's and women's first games at The Depot Craft Brewery Distillery. Final dates and times will be announced after the tournament schedules are released Sunday, March 5, 2017. 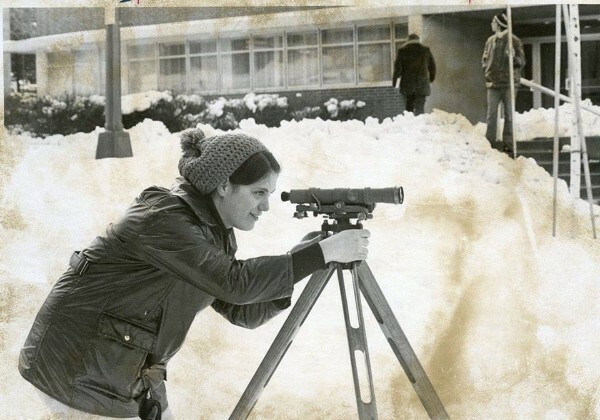 The more things change, the more they stay the same, particularly where snow is concerned. 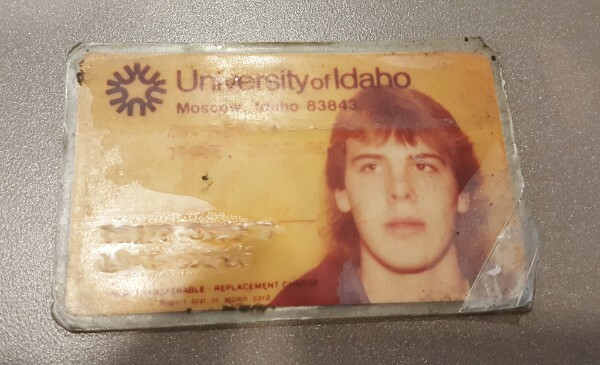 Know anything about this University of Idaho College of Engineering photo? It was donated to the University of Idaho Library in 1991. Let us know at vandalvibe@uidaho.edu. When it comes to recruiting new Vandals and making college accessible and affordable, we can never have too many tools at our disposal. We want more Idaho students to experience the value of a University of Idaho education, and there are also amazing possibilities to recruit students from the states that border our own. That is why it is great news to hear that our alma mater is revitalizing the Western Undergraduate Exchange or WUE program. Many of you may have benefitted from WUE in years past. It is a multistate program that allows college students across the West to attend school at reduced out-of-state tuition at participating institutions. Beginning this fall semester, newly admitted students who meet the criteria will automatically receive WUE tuition and fee rates, which is 1.5 times the in-state rate. The savings is substantial – more than $11,000 a year less than paying full out-of-state tuition and fees. The UI turned a corner with the enrollment increase it experienced last fall, and growing the overall enrollment remains a primary goal of the institutional strategic plan. Revitalizing our efforts and expanding our toolbox for recruiting students – in Idaho AND out of state – is going to make accomplishing that goal much easier. As we prepare to welcome a wave of new Vandals, be sure to help us Pave the Road with Silver and Gold leading up to March 25 and April 1. 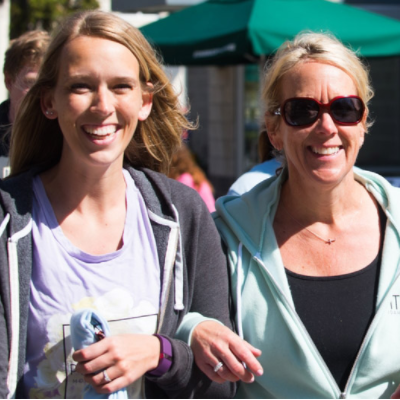 Prospective students and their parents from throughout the Pacific Northwest and beyond will gather on campus those two days for tours, informational sessions on everything from financial aid to campus life, and the opportunity to visit with faculty. We want them to see signs of Vandal pride cheering them on from every direction. 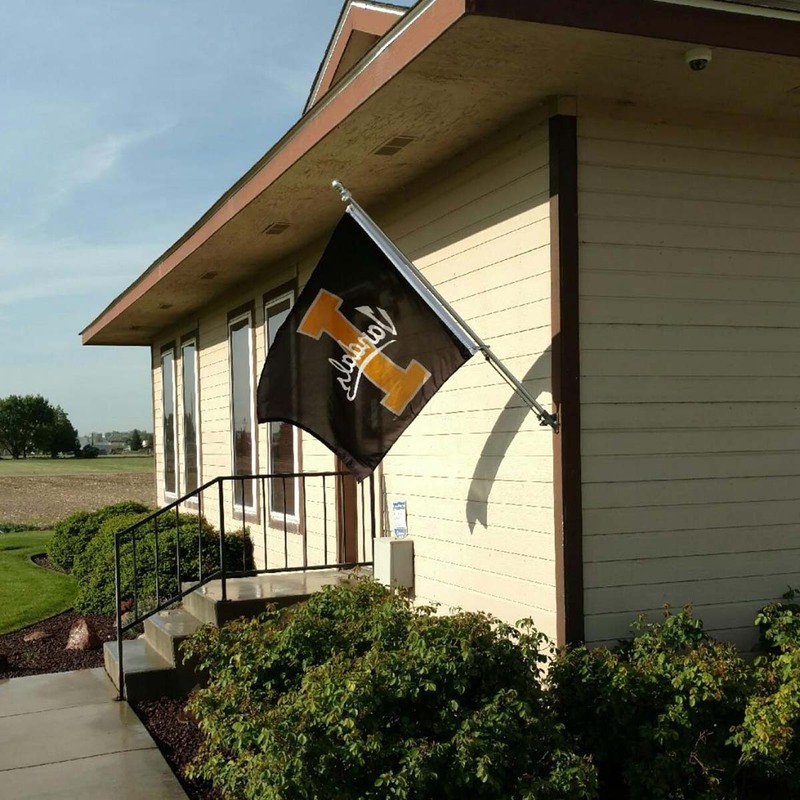 So, fly your Vandal colors from your home or business. Don your Vandal sweatshirt. And those of you not along one of the primary routes to campus, fly your Vandal colors anyway and join us in spirit. Send us a picture, and we’ll be sure to share it online. Join the charge to cheer on future Vandals and their families. Help us Pave the Road with Silver and Gold! Hundreds of parent and their children will make their way to Moscow the last two weekends in March to visit the University. 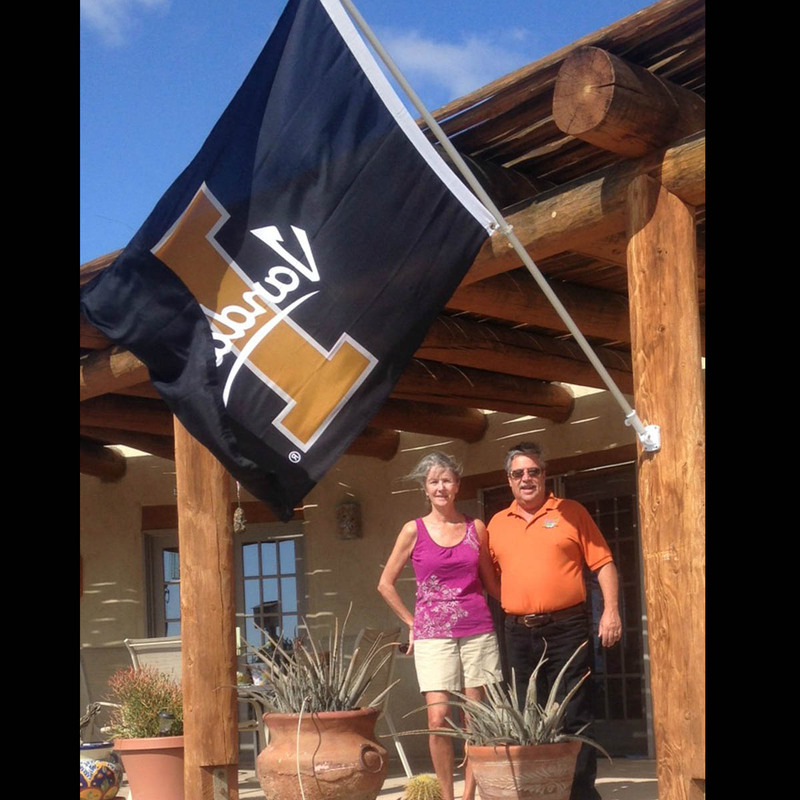 On those days and the days around them, we ask that you fly your silver and gold UI flags and memorabilia. Go all out and make a Joe Vandal living diorama or epic UI lawn decorations or sync your house lights to the Fight Song or more! It can be outside your home, work, car or any viewable place. Use your imagination! Have a business you want to participate? Email vandalvibe@uidaho.edu for more details. 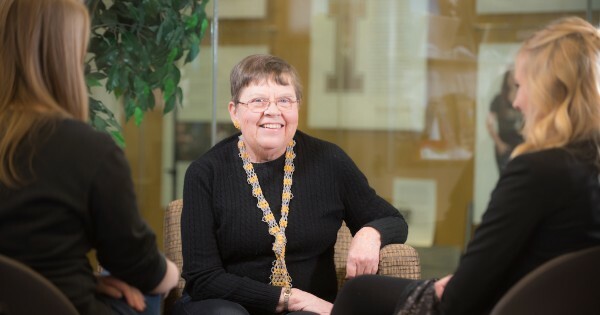 No one experiences the joy of giving back to her alma mater quite like Joy Irving ’64. A native of Moscow, Idaho, and first generation college student, Joy received much love and support from her parents. 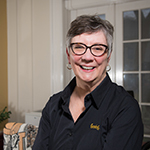 They encouraged her to attend the University of Idaho and earn a bachelor’s degree in home economics, what is now called family and consumer sciences. She is now passing on that support by donating to UI scholarships to aid students on their journey through higher education. Joy has committed to an additional $20,000 to cover the funding for graduate students in chemical engineering for 2016. Beyond the gifts Joy makes each year, she has provided for a gift in her will to continue her support for graduate and undergraduate scholarships in chemical engineering, graduate scholarships in food and nutrition and internships in UI Extension. In this way, Joy will continue to help UI students forever while maintaining her financial security now. 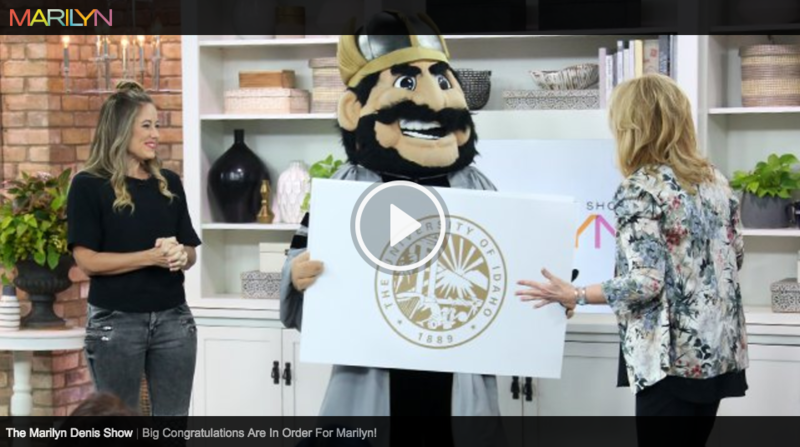 University of Idaho alumna Marilyn Denis has been selected as the University of Idaho 2017 commencement speaker and as an honorary degree recipient. The surprise announcement was made today, Feb. 28, during a live taping of the Canadian daytime series “The Marilyn Denis Show” on CTV. UI staff members coordinated with Denis’ TV production crew to orchestrate a surprise taped video appearance by Andrew Kersten, dean of UI’s College of Letters, Arts and Social Sciences, and a live in-studio appearance by UI mascot Joe Vandal. After Kersten reviewed Denis’ “university files,” he read pieces from her nomination letters, calling Denis an inspiration to women in broadcasting in both Moscow and Canada. 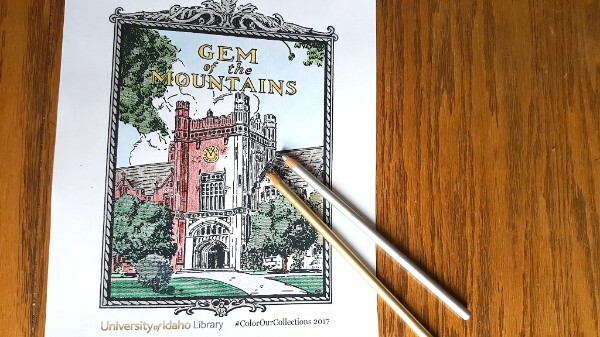 The 2017 Gem of the Mountains coloring book is now available! Get out your crayons, colored pencils, markers and download the free UI Coloring Book.